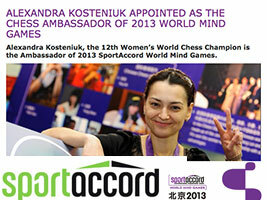 This year again, 12th women’s world chess champion Alexandra Kosteniuk will be the official Chess Ambassador of the 2013 Sport Accord World Mind Games, which will take place in beijing, China between the 12th and 18th of December 2013. You can read the official announcement here. This is the third edition of the Mind Sports Games. It’s a unique multi-sport event which highlights the great value of Mind Sports. The world’s best players will deliver top-level performances and create new valuable experiences based on intelligence, strategy and exercise of mind. At the same time as I received the Certificate of Honorable Master of Sports of Russia last week (see post), I received officially the Medal and booklet representing the Order For Merit to the Fatherland. 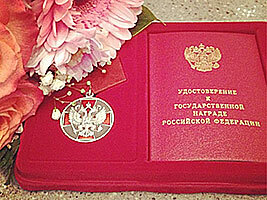 The certificate to me, Alexandra Kosteniuk was signed by President Medvedev. This award was given based on my win of the women’s world chess crown in 2008, and is extremely rare, even in the second class. Read about the Order For Merit to the Fatherland on Wikipedia. 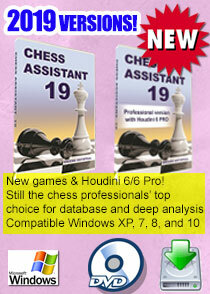 It shows how important Russia considers the game of chess and values champions who have brought fame to their country. 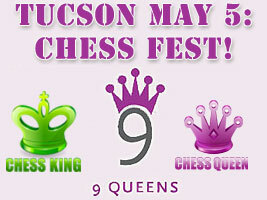 Press Release: 9 Queens brings Chess Queen Alexandra Kosteniuk to celebrate Tucson’s chess community. 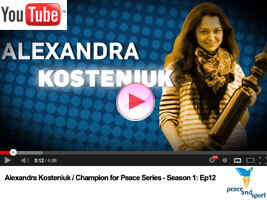 Alexandra will be honored at the 5th Annual Chess Fest and will receive the 9 Queens Award. 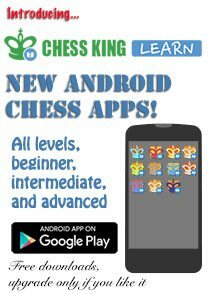 The event is sponsored by the Soroptomist International of Desert Tucson and Chess King software. Read the full press release below and mark your calendars if you can make it to Tucson on May 5! 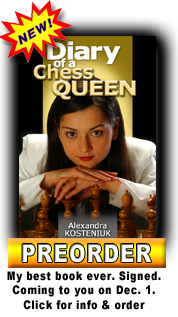 Signup for the free Chess Queen Kosteniuk Newsletter! 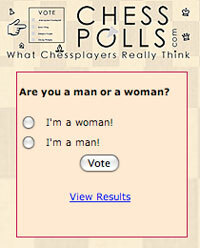 Lots is happening in the world of chess. 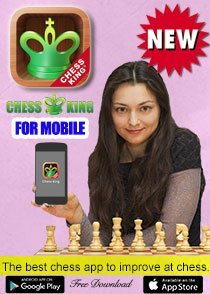 I’m also working on several new big projects, as well as playing many chess tournaments. 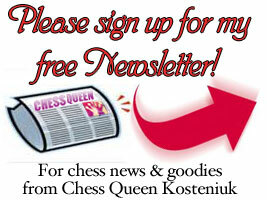 To be able to share the information with you, I am creating a special free chess email newsletter. 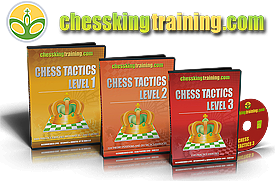 It will contain information on the world of chess, notable chess news, tips, and also news on what projects I am working on. 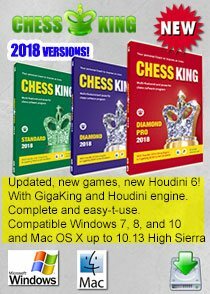 I also will share exclusive news to my Newsletter subscribers before anybody else, and will run some chess puzzle competitions with prizes only for subscribers. Gifts and coupons for free goods and large discounts on products will be included in each Newsletter. Since the newsletter is totally official and will not be spam (it will be opt-in), after you sign up in the right column of my site, after you get the confirmation email please click the “confirm” link. You’ll be able to unsubscribe anytime, of course, but I hope you will stay with me as long as possible! 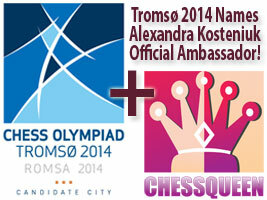 I am pleased to let you know that today I have been named Official Ambassador for the bid for the 2014 Chess Olympiads in Tromsø, Norway.